Otoplasty is the reshaping of protruding ears. This is a corrective cosmetic surgery which helps to set large ears back. It is also known as “ear pinning.” However no actual pins are used. The way which ears are set back is by using stitches placed in the cartilage to hold the ear in its new position. The cartilage may also be weakened by the surgeon to allow for greater change. Otoplasty is ear surgery which aims to pin back ears. Prominauris is the latin term for ears that stick out to much. Repair of this is also called ear pinning. The ears are not really pinned back though. 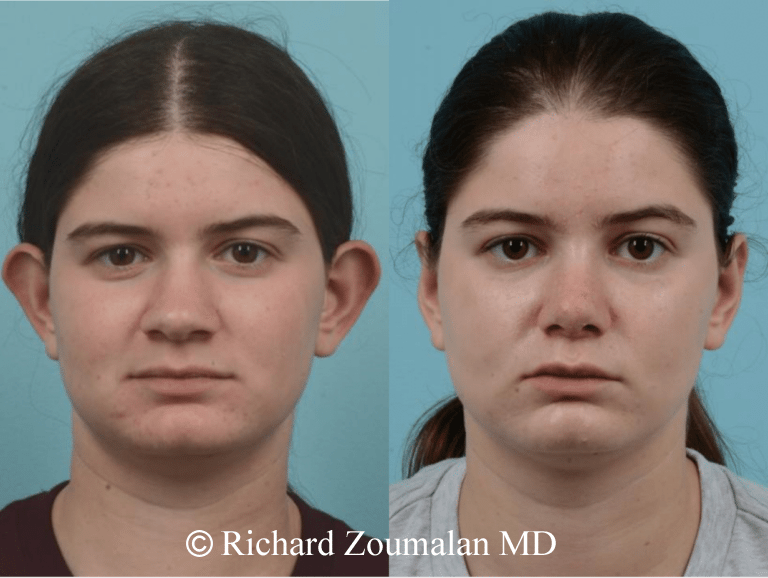 This patient underwent otoplasty and rhinoplasty to help improve her overall facial features. Why do I have big ears? The reason for having “big” ears is usually not that the ears are larger than usual. In fact, the dimension from the top to the bottom of the ear is usually not the problem. The problem is that there is lack of development of the anti-helix (a fold in the ear cartilage) as well as a deep concha (cup) of the external ear. This causes the ear to be protruded (sticks away from the head). This appears as a big ear to the observer. The normal distance from the edge of the rim of the ear to the mastoid (skull behind ear) is near 1.8 cm. Protruding ears have a distance that is significantly larger. Otoplasty is performed for both men and women, adolescent and adult. It is more commonly performed in men because they wear their hair shorter and have ears exposed more often. Women who have short hair or like to wear their hair up prefer to have Otoplasty commonly as well. Adult Otoplasty has the advantage of being able to be done under local anesthesia. However, most adults prefer to have intravenous sedation. Dr. Zoumalan recommends this for adolescents and adults. Otoplasty best performed in children at preschool age: ages 5 to 7. This is the most common time that children undergo Otoplasty. The second most common is during the childhood years after preschool. This can be done at our accredited surgery center or at Cedars-Sinai Medical center. One parent is allowed to come into the room and be at the child’s side until the child is fully asleep. The anesthesiologists that perform this procedure are board-certified and have pediatric sub-specialization.. Ear lobes can be large or elongated either due to tension from earrings, from a traumatic pull of an earring, or from lobes being pulled from after Facelift/Necklift. Dr. Zoumalan can correct all of these in the office under local anesthesia. There is little to no pain from this procedure. The recovery is minimal. All patients can return to work or school the next day. These are before and after photos of a woman who had undergone previous facelift surgery and had resulting Pixie Ear Deformity. This is when the ear lobes are pulled down due to excessive tension from a Facelift or Necklift. 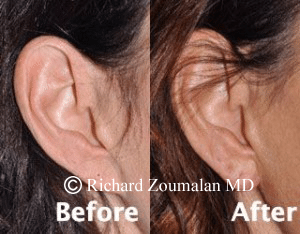 Dr. Zoumalan corrected this procedure and made the ear lobe smaller and more natural appearing. Otoplasty surgery is entirely done with a small incision behind the ear, in the crease between the ear and head. Otoplasty can be performed under both local and general anesthesia dependent on the patient’s preference. The exact procedure for a protruding ear depends on the anatomic issues that have to be corrected. The surgeon must evaluate how deep the ear concha (cup) is. The Otoplasty surgeon must also examine the degree of lack of development of the fold of the ear. These are usually the main issues that need correction by Otoplasty. There is little to no pain after surgery. There will be a dressing/bandage after the surgery for the first week. There may be some bruising which is usually all gone by 7 to 10 days. Sutures are usually self-absorbable and do not need removal. We have all patients wear a head-band for the first couple of months at night to help keep the ears in safe position at night. Adults and adolescents can return to work/school at one week. Insurance has only been known to pay for children in some cases. This is rare. Our office can help you determine this.